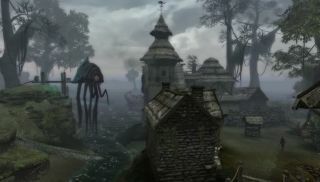 In this, the next leg of Skywind's tour of a remade Morrowind, we see Seyda Neen—the town our protagonist arrives in, fresh off the prison boat, at the start of the game. "Our 3D artists have recreated and re-imagined this iconic town with updated buildings and clutter," explains the trailer's description. Skywind is a remake of Morrowind, for Skyrim—reimagining the locations, enemies and quests and placing them in the most recent Elder Scrolls game. This is just latest in a number of environmen previews for the Skyrim mod. Head to our Skywind tag page to see more.